WHAT IS THE BEST WAY TO LEARN MANDARIN? Of course, some will ask: Why is Mandarin such an important language to learn today? To begin, there are more native speakers of Mandari n than any other language in the world. 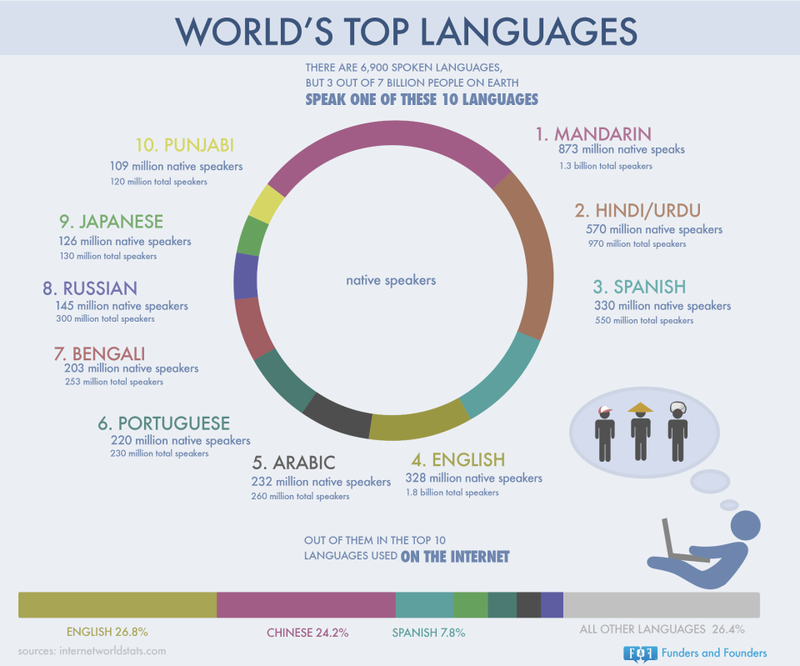 It’s currently the third most spoken language in the United States, after English and Spanish. Mandarin is the primary language spoken in China, but it’s not the only Chinese language. Cantonese is spoken in Hong Kong and the Guangdong province, as well as by many Chinese speakers in the U.S, Canada, U.K, and Australia. China’s economy is growing very fast, and China is investing heavily in the United States. Whether your primary intended use is for business, diplomacy, academic interest, or other reasons, Mandarin is a very significant language to speak. One roadblock for learning Mandarin is that to read and write in traditional Mandarin characters requires knowing over 3000 characters. However, you need not write Chinese to converse or even to travel in China. Moreover, many younger Chinese today do not themselves know this many characters. Given the prevalence of computers, it has become more and more common to transliterate Mandarin into the Roman alphabet. To begin, your ear will need training to hear differences of tone as well as pronunciation. It will be equally important to listen (very carefully) and repeat, thereby learning to reproduce subtle differences in tone and inflection. Spaced repetition is essential for learning vocabulary efficiently. Chunking, being able to use and adapt frequently used phrases, is another key technique. I would also look for a focus on conversation, rather than literacy. I would prefer a method which makes ongoing adjustments to its instruction based on my responses – depending on my own particular strengths and weaknesses. All this being said, the best way to learn is also one which keeps your interest long enough for you to gain proficiency. Some of the most commonly available courses in Mandarin include: Rosetta Stone Mandarin, Rocket Mandarin (free trial), Pimsleur, Living Language, E-teacher, Berlitz, Complete Mandarin Chinese: A Teach Yourself Guide, Assimil, and Fluenz Mandarin, as well as Earworms Chinese – Mandarin, Italki, and Before You Know It. See my review of Rocket Languages, as well as brief descriptions of other language learning methods. I am currently in the process of reviewing and evaluating these various programs. So, come back soon for additional help. As always, I appreciate your comments and will do my best to reply in a timely manner. This article is very relevant to the business and tourism industry. The massive Chinese economy, although it has its ups and downs, is here to stay for sure. Good article! Your point of our ears needing training to hear differences of tone as well as pronunciation is a big one. Do you think it s important to surround yourself with Mandarin speaking people to learn the language properly? Thanks for your gracious comments, Michael. As to your question: Ideally, yes! However, I’ve learned there are a variety of ways to “immerse” yourself in the language today without even leaving home. If interested, take a look at my article “What Is the Fastest Way to Learn Spanish? (or any other language)” The language is different, but the same principles apply. Great Site. Love the information you have provided. I have always wanted to learn a new language. Researching before you begin a new language is great advice. Reading magazines, books, and even checking out videos is a great ideal. I was wondering how many languages do you speak? It is a well written article. Thanks for sharing. Thanks, Vicky. What new language are you interested in learning? For my back story, check out my About Me page. My sister recently got through to work as an English teacher in China. She does not speak any Chinese language, that was not a requirement for the position. Nevertheless, she wants to get acquainted with their language so that she can communicate basic things to the natives. She will be there for 1 year, so she really wants to learn the language. One of her fear is the various characters or symbols they used. I will pass on your recommended language programs so that she can get started. Thanks! It’s quite possible today to converse or travel in China with no knowledge of Chinese characters. As I point out in What Is the Best Way to Learn Mandarin?, much Chinese is transliterated into Roman characters today. My personal favorites for her situation would be Pimsleur for speaking/listening or Rocket Languages for reading/writing as well.